Canaries in the wild mostly eat seed and are vegetarians. Their food preferences will change with the season, and it can switch from seed to wild berries and other vegetation. Canaries will on occasion eat insects if plant based food in not available. What Do Canaries Eat, And Canary Food? 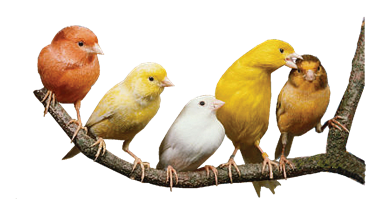 If you own canaries as pets it is important to know what do canary eat and provide the best diet possible for your bird. In the wild canaries will eat diversed diet and this must also be achieved with your pet. Canaries will eat seed, pellets and greens. Wild canary diet will be 80% seed and will vary over seasons. Commercial Bird Food for Canaries can be a good food for your bird as they contain more than one seed type. This however in not what canary should eat all the time, to much of the same food will lead to lack of some nutrients that keep the bird healthy. Canaries love millet seed and owners often get it on a millet spray in the pet stores. These are good for the birds but try not to offer it more than one branch a week, to much of the same food will not benefit the bird in the long run. Most of the commercial mixes will be similar in composition, as long as they offer 3-4 different seed types the bird will do ok. It is best to keep the seed at about 70% of the canary diet, and the other 30% offer fresh vegetable, fruit and boiled egg. The most common mistake pet owners do is offering just the seed and thinking the bird is getting all it needs. This can lead to some vitamin deficiencies and birds can become to fat. Pellet diet is designed to offer the canaries with as close as natural food they can get. Canary Pellets will contain the most balanced formula but the birds need time to get used to them. There are even pellets available to treat some diseases and conditions of the bird. If you have a birds that was raised ona a seed diet it can be difficult for them to switch to pellets. Do this in stages and slowly, offer seed and pellets in two separate containers and gradually offer less and less seed in the period of 3-4 weeks. Make sure the bird is eating pellets before you stop offering seed. Vegetarian diet should account for about 30% of canary daily intake. You can offer fruit, vegetables and greens that your bird like. Always wash the food before offering, and if you can get organic produce, chemicals used on vegetables can harm the birds over time. It is best to slice the food in smaller pieces so the bird can eat it more easily, place them in a container or hang on the side of the cage. Some birds will prefer one fruit or vegetable over another, but try to diversify it as much as possible. You can offer fresh greens every day about on third of the birds diet. To keep the bird healthy fresh water must be available day and night. Birds need access to fresh water too stay in top shape, you can even provide a bathing dish for the bird, birds love to bathe in water when it is available. Clean your water container from dirt regularly. 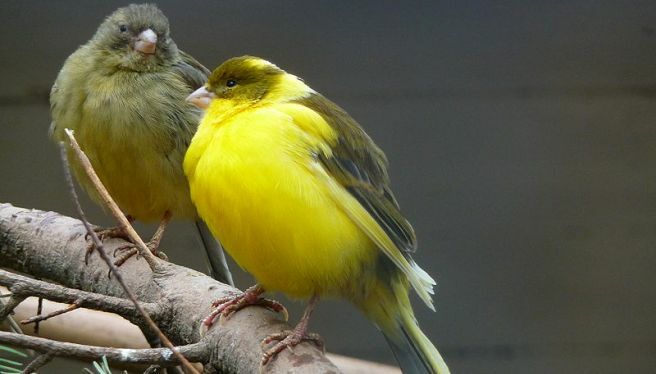 Canaries are solitary birds and live alone in the wild, so if you have just one bird it will do just fine, if you plant to keep two or more birds some may not get along. In that case it is bets to provide a big cage or aviary so birds can have their own territory and establish pecking order. If you notice one bird constantly molested by others remove it from the group, as canaries are solitary birds it will do just fine on its own. Canaries have one of the most beautiful songs in the bird world, but they tend to sing only when kept as individuals. Most canary owners will notice that when another bird is introduced they stop singing. This is because they use a song to attract mates and when one is available there is no more need to sing. Male canaries sing more than females. So if you plant to get a singing canary, you should get only one, and preferably male. When keeping birds there is a simple rule, get the bigest cage possible. Canaries love to fly from one perch to another, so get a cage that is more long then tall. See how much room you have in your place, but just like you birds love larger homes where they can fly. - Place the cage near a good natural light source, next to a window or balcony. You can even keep them outside under some protected area. In winter bring the cage inside and take it out again in spring when warm weather arrives. - Place the cage approximately 6 feet above the floor. Birds love to be higher, never place the cage on ground level. Make sure there are perches in the cage for the birds to stand on. You can get natural wood from the nearby forest or buy them at the pet store Birds need perching spots, and room to fly from one perch to another. This way a canary will have a lot of excessive and stay fit. Some canaries also like swings. If you have one dont place it so it blocks the birds flight path, canaries need a room to fly.